There are many dental myths, which could be preventing you from taking good care of your teeth and gums. Find out the facts and make changes that can improve your oral health. Many people use medium to hard toothbrushes thinking that this will clean their teeth better. If a bathtub is cleaner from a more abrasive sponge, shouldn't the same be true for teeth? According to dentists, the answer is no. Hard toothbrushes are more abrasive to gums and over time can even lead to receding gums. 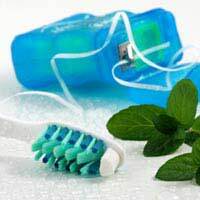 Use a soft toothbrush but brush thoroughly and for several minutes. While you may think that experiencing a burn or strong tingle signifies a cleaner mouth, this isn't true. That burn isn't from bacteria being killed. Rather, it's a response from irritated tissues in the mouth. It isn't to say that you are doing harm as such if you do feel this response. But if it's unpleasant, you can get the same results from a mouthwash that doesn't burn. If flossing is causing your gums and teeth pain or irritation, this is all the more reason you need to do it regularly. Those who don't floss regularly or at all are more likely to suffer irritation. Not flossing puts you at a higher risk of plaque build-up that leads to gum disease as well as bad breath and other dental problems. Just because you can't see any issues with your teeth and gums, doesn't mean all is healthy. If this were the case, x-rays would essentially be useless. Your dentist and hygienist are trained to spot problems with your mouth, teeth and gums. Regular checkups are key to preventing and treating issues. Many people still believe that if a tooth is knocked out such as in sports, that they will save it by simply putting it in a container and taking it to the dentist to be re-implanted. The truth is that by the time they get there, it's usually too late for successful implantation. The tooth should be put back in the mouth immediately or at least within the hour. Then, see your dentist. For a lot of people, it seems that their oral health is bottom of the list in terms of priority. Why do teeth matter? Apart from helping you look good and being part of a first impression, oral problems can affect chewing, swallowing and even cardiovascular health. Make dental visits a consistent priority. You may think your oral health is isolated from the rest of your body. But in fact, many other health problems can impact your mouth. One example is osteoporosis, a thinning of the bones throughout your body. Another example is the medicines you take for a health condition. They could dry out your mouth, increasing your chances of tooth decay and other oral problems. It's a myth that sugary drinks do no harm and one only needs to worry about sugar in foods. Drinks actually bathe the teeth in sugar, which can lead to tooth decay. An overall low sugar diet is beneficial to your body and your teeth but avoiding sugary drinks between meals and brushing after meals can help. It is true that dental care can be significantly cheaper around Europe. But sometimes you do get what you pay for and problems can occur. Regulations vary and it can be harder to investigate your dentist's accreditation and skills outside of Britain. It isn't to say that a dental holiday can't be successful. But you do need to exercise more care and should never assume that all will go according to plan. Also keep in mind that should something go wrong, you would have to cover the cost of going back to the country where you had the dental work performed. Some parents may mistakenly believe that since their child's baby teeth fall out, brushing isn't necessary. The fact is that these early years are important to establish good oral hygiene. Neglecting to do so can make it more challenging later on. Also, any decay can still harm your child's gums, affecting oral health in the future. Now that you know about dental myths, put your knowledge into action. Resolve to take better care of your oral health and visit your dentist regularly. Is Water Fluoridation Really Beneficial?